Christensen, Ole C., and Niels Søndergaard. 1. Maj Mysteriet . Carlsen Comics 1991. Series note: Graphic novels 1. 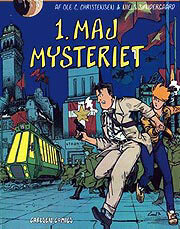 Maj Mysteriet , Den Anden Præsident , and Det tredje øje . What if: Denmark had a communist revolution c. 1920. Summary: A Danish scientist discovers travel between different worlds and invites some of his "doubles" to an informal congress, at which one is murdered. Series note: First story of the Dimensionsdetektiven. Published: Carlsen Comics 1991 (8756252862). Translation: Norwegian as 1. mai mysteriet , Carlsen 1992. Translation: German as Der Rätselhafte 1. Mai , Carlsen 1992. What if: Several European states entered the USA c. 1910, making it the United States of the Free World (USFW). Summary: A coup d'etat is plotted against the president, traveling to his home state of Denmark to inaugurate the new, 125-meter statue of "The Great Mermaid" in Copenhagen. Series note: Second story of the Dimensionsdetektiven. Published: Carlsen Comics 1993 (8756260725). Translation: German as Der Falsche Präsident , Carlsen 1993. What if: Germany did not invade the Soviet Union in 1941, and the Axis won a smaller-scale World War II. Summary: The divided city of Copenhagen becomes a "Singapore with Berlin walls" as the Axis powers fall out. Tensions rise 50 years later as the city reunites with German-occupied Denmark. Series note: Third story of the Dimensionsdetektiven. Published: Carlsen Comics 2001 (8756262728).